Are you looking for something unique for your special event, fair or festival and are tired of bounce houses and balloon twisters? Mr. Bond’s Science Guys have the answer with our Mobile Science Lab that includes Sensational STEM shows and interactive science booths. Our edutaining “science presentations” can be the main attraction at your special event or you can choose from our mobile science labs/hands-on booths as an interactive addition to your planned activities. You can also book both to make your event even more exciting! Our science demonstrations can be customized to fit any group size and we will do our best to work within your budget. Contact us to find out more now! 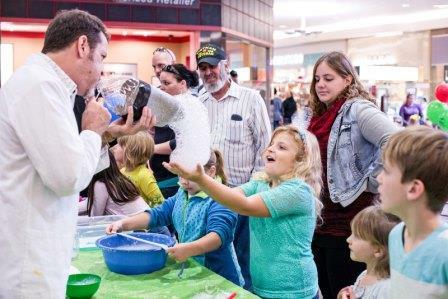 Audience involvement, laughter and science experiments are a part of the package when our crazy scientists demonstrate chemical reactions, explosions and mind-boggling experiments at your special event, fair or, festival. Our Sensational STEM/STEAM Shows bring kids of all ages and science together for a memorable event! The Science Guy’s special events are science-themed shows designed to impress and captivate audiences of all sizes. Children learn about science as they observe optical illusions, experience tornado simulations, create volcanic eruptions, discover Bernoulli’s principle, and much more! Mobile Science Lab for kids, teens and adults! Cotton Candy Fun - kids can make it themselves or we do it for you! Hair Raising Electricity - Van de Graaff Electro-static Generator creates hair-raising fun. Best indoors and low humidity. Current Events - Discover electricity with multiple electrical experiments. Schedule A Mobile Science Lab Today!